The L pack consisted of overriders, dummy vents and side trim, wheel trims, exhaust trim, locking fuel cap. The X pack was the interior kit and comprised fully reclining front seats separate contoured rear seats with a folding centre armrest, a day/night interior mirror, dual horns parking brake, warning lamp, reversing lights and an additional interior light. Add the two plans together to purchase the XL spec. All available with a choice of 1300cc or 1600 cc Kent XFlow engine. 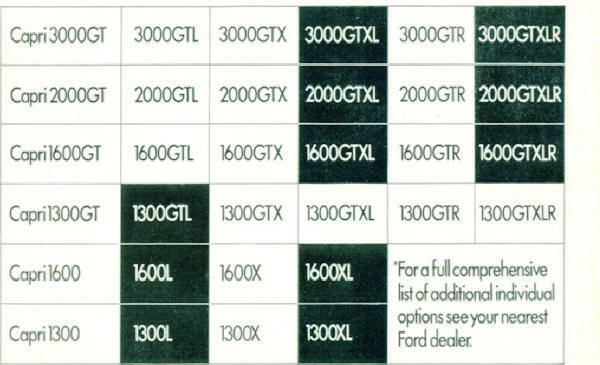 Or your could purchase a GT which came in engine sizes 1300/1600,2000,and later the 3000 cc. The spec then became GTL/GTX or GTXL. The GT not only differed by having an uprated engine it was also offered with radial ply tyres as standard. Inside the gear stick had a leather gaiter and a centre console unit. There were more pods on the dash board as it included a rev counter and an oil pressure gauge. A vanity mirror, clock and cigar lighter were standard, 1600GT and 2000GT also had servo assisted brakes as standard too. But there was another pack - the 'R' and only available if you purchase a GT. The 'R' pack consisted of sculptured road wheels, leather rimmed sports steering wheel 'quartz -halogen fog/pass lamps with protective covers, body side mouldings, map reading lamp, matt black radiator grille and special sports paint scheme in sub-gloss black. This Capri was badged GTXLR and proved to be a very popular option. The 'E' model had the V6 Essex engine and fully trimmed GTXLR but without the sports paint option. 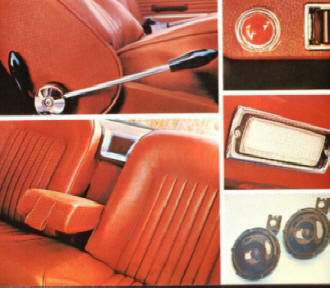 Rear armrests included ash trays, the dash had GT instrumentation as well as a push button radio and a control for the heated rear window and opening rear quarter windows.